VietPress USA (July 18, 2018): President Trump sided with Russian President Putin to defense Russia was not involve to meddling the U.S. Election 2016. Trump accused the investigation of Special Counsel Robert Mueller and denied any services of the American Intelligence community. To fight back the declaration of President Trump in protection of Russia, today FBI Director Chris Wray who newly appointed by Trump has confirmed that "Russia attempted to interfere in the last election". Speaking at the annual Aspen Security Forum, Wray also reiterated his belief that Special Counsel Robert Mueller's investigation into those Russian efforts, and possible collusion with the Trump campaign, is not a "witch hunt," as Trump has called it so many times. With support from President Trump, Putin stood next to Trump at the joint press conference in Helsinki on July 16. 2018, denied that Russia never interfere in U.S. 2016 election. FBI Director Wray said that Putin has his "got his view". "I can tell you what my view is," Wray added. "The intelligence community's assessment has not changed, my view has not changed, which is that Russia attempted to interfere in the last election, and that it continues to engage in malign [activity].". 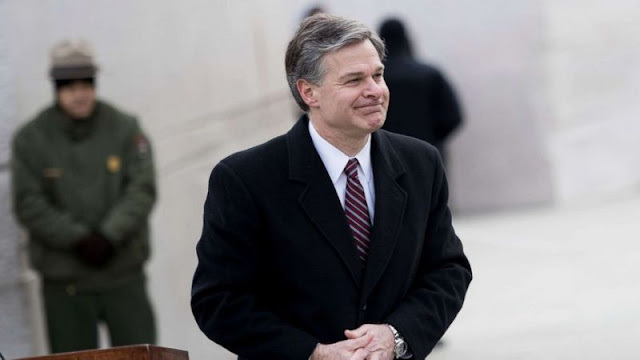 As President Donald Trump continues to "clarify" his views on whether Russia launched an assault on the 2016 presidential election, the FBI director made his own views clear today: "Russia attempted to interfere in the last election," FBI Director Chris Wray stated unequivocally. Asked to respond to Russian President Vladimir Putin's denial of interference, as he stood next to Trump at the summit in Helsinki on Monday, Wray simply said Putin has "got his view." "I can tell you what my view is," Wray added. "The intelligence community's assessment has not changed, my view has not changed, which is that Russia attempted to interfere in the last election, and that it continues to engage in malign [activity]." Wray noted that Russia will identify divisive issues inside America and then use fake news and propaganda to "spin people up on both sides of the issue and then watch us go at each other." He said the U.S. intelligence community has not yet seen attempts by Russia to target specific election-related infrastructure in the months before the midterm elections in November, but "it’s a threat that we need to take extremely seriously and need to respond to with fierce determination." Nevertheless, Wray pushed back on Trump's attacks on Mueller's probe as a "witch hunt." “I do not believe Special Counsel Mueller is on a witch hunt,” Wray said, describing Mueller as a "straight shooter" who's running a "professional" investigation. Asked whether he ever came close to resigning amid the attacks on the FBI, Wray simply said he knows he's a low-key guy but "that should not be mistaken for what my spine is made out of." That comment drew applause from the crowd at the forum in Aspen, Colorado.